After the dust of Season 1's explosive finale has settled, Aksel receives the answer he was looking for so desperately. Finally, his quest for justice seems over and reconciliation with the people is palpable. But Aksel's hope is short-lived. 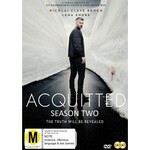 When Eva and William forge against him and cast doubt on the truth, a new fight breaks out for Aksel. Since Eva seems to cover up with William, he asks himself: what secret could be so important that a mother protects her daughter's murderer? As the impenetrable fog of lies and vindictiveness that shrouds the decades-long murder case clears, the showdown between Aksel and his arch-rival Eva is inevitable. And only in this way can the truth seal Aksel's fate.